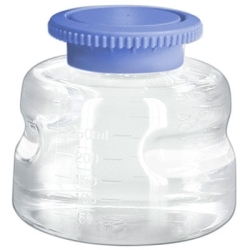 1000mL Polycarbonate Sterile Bottles with Polypropylene Caps | U.S. Plastic Corp. 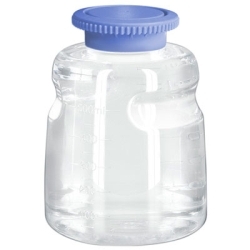 Disposable laboratory storage bottles have been designed specifically for life science researchers to store common laboratory solutions such as tissue culture media, serum, and buffers. Our polycarbonate bottles are highly transparent, shatterproof, and have good alcohol resistance. They are radiation sterilized and rated to withstand three autoclave cycles (bottle only). Each Autofil™ bottle has features that improve the handling of the bottle, especially when the bottle is wet. 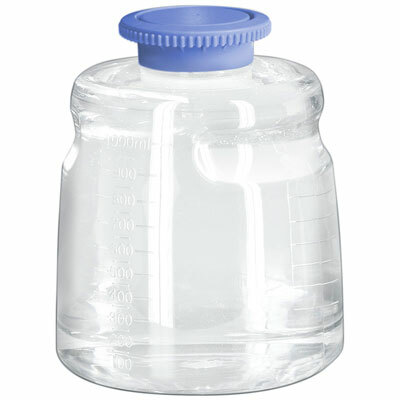 The bottle itself has a sloped design that improves stability when placed on the work surface. The narrow bottle shoulder, combined with the molded finger grips, improves the ability to securely grip the bottle with gloved hands. The patented* SECUREgrasp™ bottle cap enables easy handling and carrying of the bottle.